AudioValve puts most of our budget towards the sound quality of our design and components rather than all of the audio jewelry and marketable designs featured by some of the comparable sounding amplifiers on the market. We would say on sound alone it outclasses its price point, for design and fit and finish it fulfills our expectations of an established company in this price range. Sound wise this amplifier ticks all the boxes, great tonality, world class 3D sound stage, a noise floor on par with all but the very best valve based amplifiers, and macro and micro dynamics in spades. 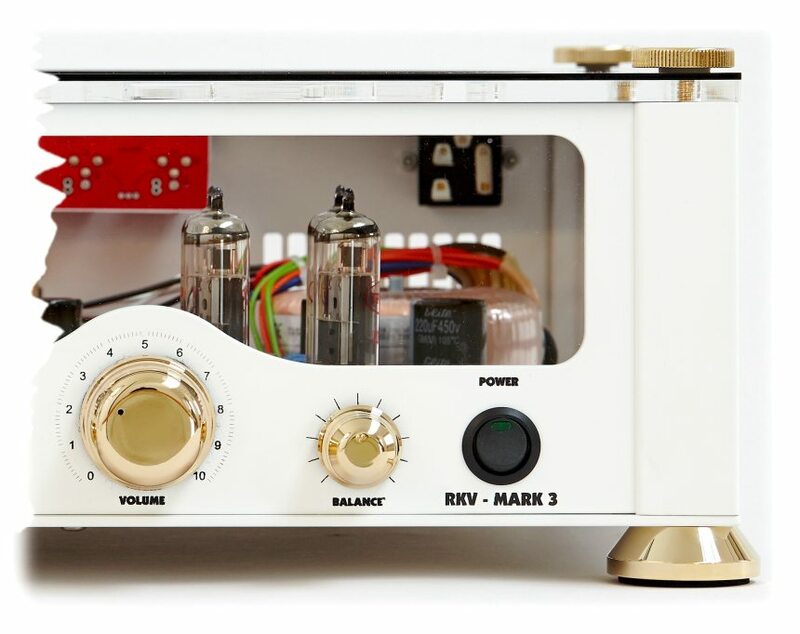 The sound quality of the RKV MARK 3 is of absolute top reference level for an OTL based headphone tube amplifier. The pros to this are rock very low noise floor, low distortions, high frequence range, high damping, very natural and musical tonality, wide impedance matching, perfect open soundstage and so on. This amp isn't for the weak of heart - this is an audioholic's . Highly recommended is an understatement, we can't tell you how impressed we have been with the development of this headphone tube amplifer. On the left side of the front aperture , the two jacks for headphones and three rotary switches. The headphone jacks are connected in parallel when using the 6.3 mm connectors. For the use of XLR connectors , take the lower bushing for the right ear and the top of the left ear . Below the two headphone jacks is the Mode switch. Use it to select the mode with which you want to hear. 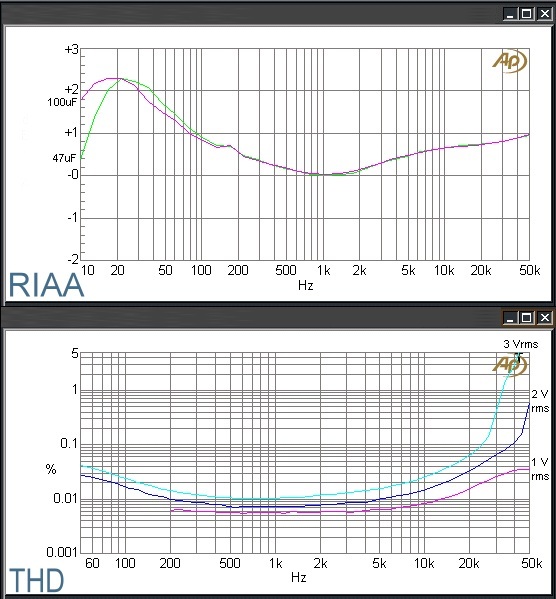 Use the OTL mode if you have a high-impedance headphones (> 100 Ohms) , or benefit you if your headset has the IMP mode less than 100 ohms impedance , or if you intend to use speakers. Which musical impedance best suit with your headphones , you have to find out for yourself. Just turn on the IMPEDANCE switch. With the last of the three rotary switches on the left, select the source you want to listen to. Then a total of 45 ( 4 +1) RCA inputs for disposal . Input 1 + 2 are also equipped with XLR inputs. Input 5 is occupied by the built-in phono module. Of these RCA phono jacks ( 5 ) you can pass the phono signal to other devices . In the middle of the front panel you find the alps volume pot, right the balance control and left the power switch. When the unit is in operation, a green LED lights in the switch. The excellent results the headphone amplifier RKV MARK 3 provides, aren´t only based on the sophisticated design of the circuit board. 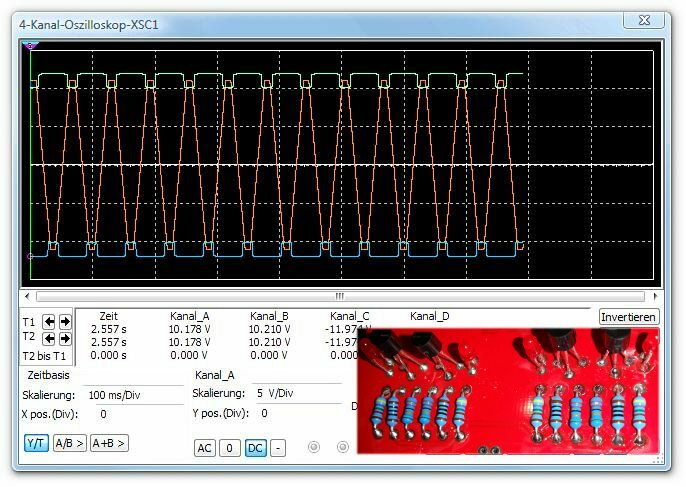 A perfect developed circuit design is only perfect when it is implemented in accordance with the practice. For all these products AudioValve theoretical and practical symboise is harmonious and coherent. This leads to a matchless musical reproduction of all sound sources. Also in RKV Mark 3 is a fully automatic biasing servo controller to use. In our new approach we have chosen a OPA134. 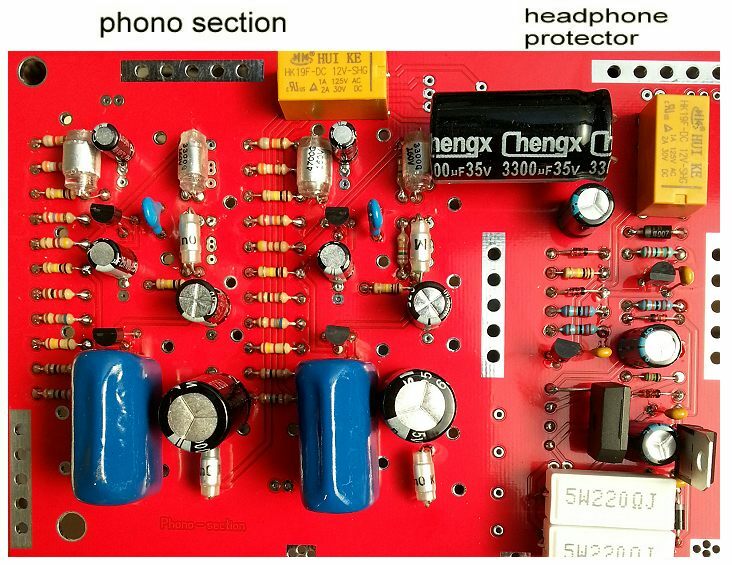 In this picture you can see the left section of the board, the phono section and the right headphone protector. The phono module is classic old school style and built with hand selected components, and fantastic musically. The headphone protector reliably protects the headphones from pulses that can occur when switching ON or switching OFF the amplifier. 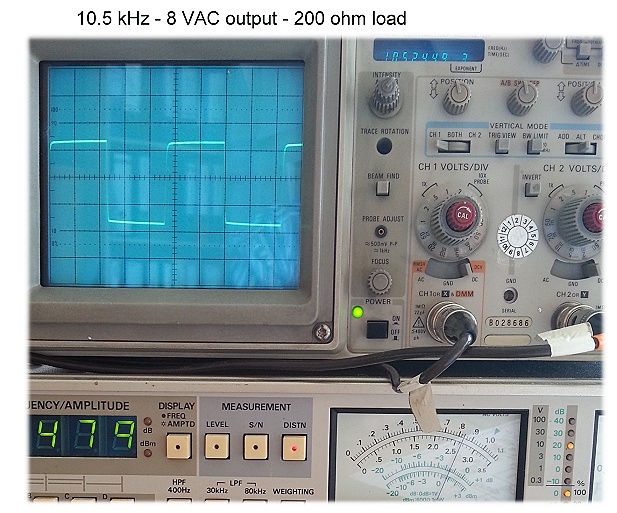 The outputs of the amplifier are shorted for this time both on power as in both cases. the circuit and PCB layout has been optimized. At the end of this long period, we got the perfect product in front of us. 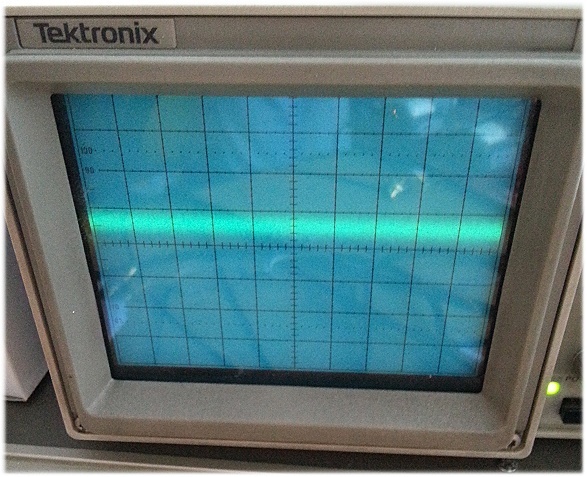 When the red sine wave at the output of the OPA reaches the upper or lower limit of supply voltage (out of range), one of the two red LED ( green / blue wave ) lights as an indication of an overload of the amplifier. Then either the volume is too high, impedance is mismatched, or a tube of this channel is faulty. multi VIA layer grounding basis, pcb design is based on the theoretical principles of the "kelvin - wiring"
highly accurate implementated stereo MM phono modul - "old school design"
This all increases the musical authenticity and also the fine resolution of the tonal balance of both channels. Dust cover and wight cloves are coming with the amp. out of the regular production, single piece selected handmade. Before I start I want to state that my testimonial reflects what I hear and what I like, it is subjective. Other high end enthusiasts may rate it differently. My ability to compare to other products was rather limited since I have heard only a limited amount of products in direct comparison. Behind the purchase of expensive high end equipment there is often a long individual high end track record. So what leads to the fact that I am a satisfied owner of Audio Valve RKV Mark III and Verto? I am a loyal long term customer of Stax. I love these headphones with their silky, smooth presentation and resolution. 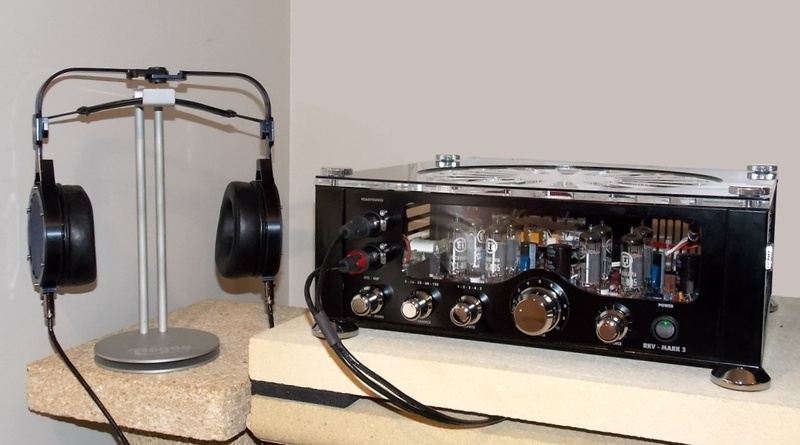 I ended up years ago with a Stax SR-007 MK2 together with the tube amp SRM-007t. Years of wonderful listening experience made the STAX combination one of the best investments I ever made in high end. 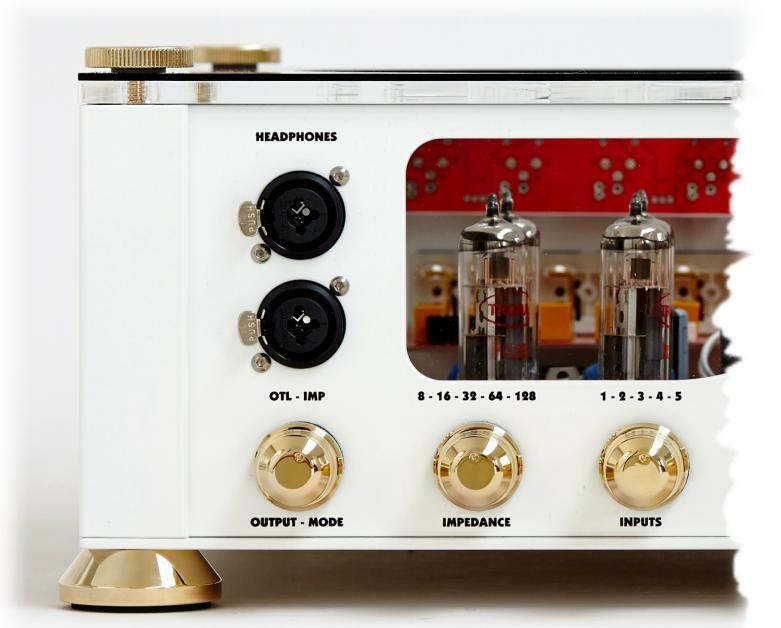 The tube amp is my favorite of all STAX headphone amps primarily because of the sonic qualities in reproducing classical music. I love classical music. But also pop and jazz, so at the end I like it all! Reading all these enthusiastic reviews I was afraid I could miss something hearing only to my good old Stax. So I tried an Audeze LCD-2 one year ago. A very good headphone with great look and feel. But at the end I had to recognize that after the attractiveness of being new and exciting was gone I did again prefer the Stax for most of my listening - regardless of the type of music. Only in the case of heavy rock or pop with extensive low frequency energy I used the Audeze. With the Audeze I did not hear the high frequency resolution of the STAX that is so important to me, I missed the delicate characteristics which makes the STAX so special, taking care of every musical detail. Someday having a lot of time during holiday being spend with reading hifi magazines I detected a strange looking new high end model called Abyss AB-1266. I read some reviews about it and decided to buy it from Hifi-Studio am Falkensee (Uwe Heile). What a great ground breaking experience! It confirmed a old rule: after 7 seconds you know whether you like it or don't like it, whether something new and special is happening. As well as the Stax the Abyss offers me a similar level of smoothness and liquid sonic. But the Abyss AB-1266 combines it with greater dynamics, incredible bass performance and a tangible and grounded sound. It is so good that you can't stop listening to your jazz, pop and rock recordings. You hear it like never before. For me a huge milestone in headphone development. So what about my final preference between Stax SR-007 and Abyss. I definitely like both. They play on the same level. I prefer the Abyss for listening to Jazz, Pop and Rock. For classical music I still tend to prefer the Stax at the end. Delicate sound making strings and vocals sound so warm and natural, showing all subtle nuances of tone without harshness. I rate the advantage of the Abyss in playing pop and rock higher than the slight advantage of the SR-007 in the field of classical music. So in total I see a very slight advantage for the Abyss. The best headphone of the world I heard so far (so far I had not heard the Stax SR-009). So let’s come to the amplification part. Today there are so many choices, every month new headphone amps announced - good times for headphone audiophiles! But if you want the best and the also the ideal match for your specific headphone (s) the amount of choices can be quickly reduced. I only heard a very small portion of the available choices. So I am not able to give ratings like "best headphone amp in the world". And to reduce the scope of my comparison even further - I heard these amps only with three headphones: Stax SR-007, Audeze LCD-2 and Abyss AB-1266. An assessment of a headphone amp could be and sometimes definitely will end differently depending on the headphone you drive. I heard the Violectric V200, Fosgate Signature, Bryston BHA-1, the headphone amp of my Accuphase C-2400 preamp and the Audio Valve RKV Mark III. My absolute favorite is unfortunately the most expensive of these: the Audio Valve RKV Mark III. Smooth and very dynamic. A powerhouse is also strong in subtle details. The Abyss is so lively with the Audio Valve. It seems that the Abyss need some freedom to play, may be you know that kind of passion by a symphony orchestra being directed by a great conductor encouraging them to play without too much control - they will play being inspired. The Audio Valve has that kind of smooth characteristics that I like - without harshness. It seems to me not being a deviation to neutrality and power. Pop and Rock are sounding great. Incredible bass performance - tight and deep. And very delicate reproduction of tone colors. The Violectric V 200 is not so dynamic, it sounds also very smooth, very controlled, a little be controlled in comparison to the Audio Valve, with less bass power in comparison to Audio Valve RKV Mark III. But also very very good. Considering the lower price of the Violectric V 200 it is an outstanding product. For me the Violectric was too good to sell it after buying the Audio Valve, the RKV Mark III was to good not to buy it after already owning the Violectric. The advantage of the RKV III is so significant that I wanted to have the RKV III despite of the significant higher price tag. 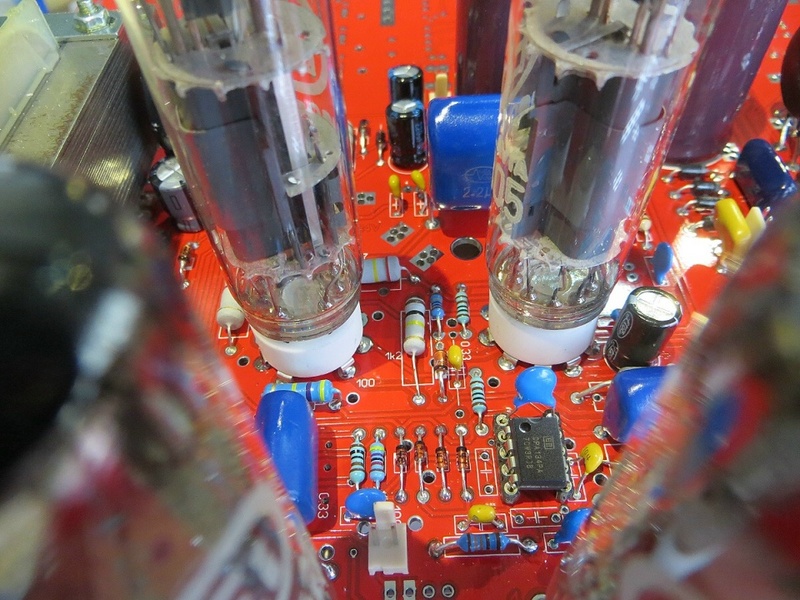 During summer I still prefer to listen with "cold" transistor components without tubes. So my Violectric knows that he is still needed, also for short listening, I prefer to switch on tube equipment only when knowing that I want to listen at least for an hour. I prefer the Violectric in comparison to the Bryston. The Bryston sounds neutral, but for me a little bit too cold. The Fosgate Signature is just not powerful enough to drive Audeze and Abyss properly, I recommend it only for less demanding headphone. With my Sennheiser HD 650 it sounds good, it has a very charming look. After buying the RKV III Mr. Becker told me about the Verto, a module which can be connected to RKV Mark II and III to drive my STAX. Initially I tried a prototype, in the meantime I bought the final product. Why? Because of the sonic quality. Verto is not a beauty in comparison to RKV Mark III. I assume no own will buy it to invite neighbors to have a look to this expensive high end gear. When you look to the photographs on the Audio Valve web page please consider that the latest version offers a labeling of the front and back plane, making the Verto looking more attractive and also as a good match to the RKV Mark III. But still you purely want it because it sounds damn good and a little bit different than Stax 007t: seems to be a little bit more neutral, clear and dynamic without losing totally that silkiness of the 007t. Offers slightly stronger bass performance. So listening to pop and rock the SR-007 has now slightly more punch I sometime miss when using the Stax 007t. So for pop and rock my favorite is the Verto, for classical music sometimes I prefer the 007t with that warmth, for other recordings the more neutral Verto. So I urgently recommend listen to these products. I am glad that I contacted Mr. Becker a year ago. Listening via Audio Valve RKV III and Verto and Stax and Abyss are the best listening experiences I can imagine. On my wish list for Mr. Becker is only one feature: a remote control for my Audio Valve RKV Mark III. My Verto is equipped with Cable HB Design and Valvo NOS instead of the standard IE tubes. In my configuration I needed a longer headphone cable for the Abyss. Joe from JPS / Abyss was not able to deliver a longer cable than the standard one, also not an identical looking extension cable. I really think Joe does an incredible good job with his cables and made a high end dream come true with the Abyss, but sorry to say that in regard to my individual wish he seemed to be as flexible as his brilliant Superconductor 3 cables ;-) I purchased a cable called "Headphone Harness" from small US based niche company Jena Labs (distributed in Europe by emotionalaudio in Netherlands). A good decision. Look and feel is very good. Sounds very good, but I did not spend effort to compare to the JPS cable. The cables of both channels are stranded together and the strand is very flexible. So the handling is by far better than with the original Abyss cable.